We sure enjoy the fall decorating ideas that are shared with us. 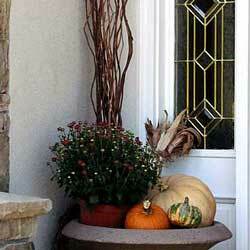 So we're very delighted to show you Lori's autumn decorated front porch. 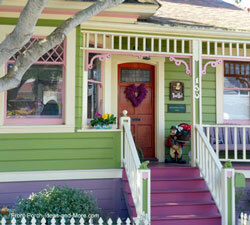 Lori is the author of Thrifty Decor Mom and her decorating style is clean, simple and very inviting. 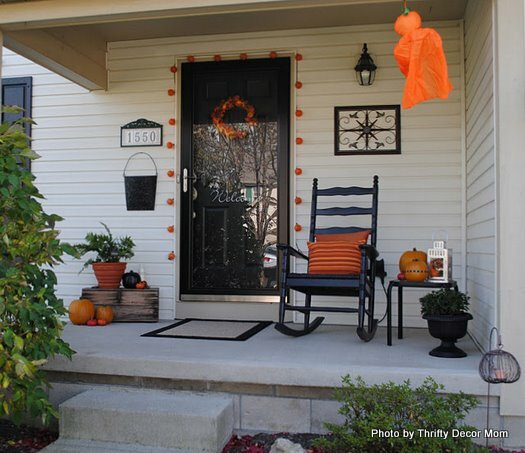 Lori is also sharing with us how she transitioned her porch from autumn into Halloween. 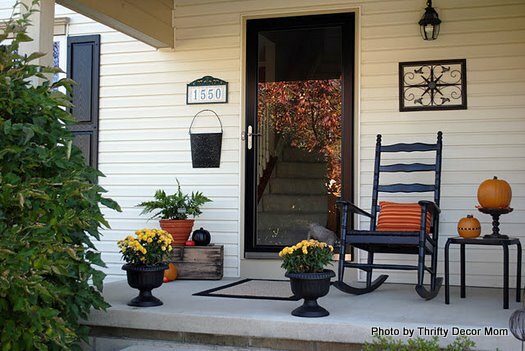 Use her fall decorating ideas for your front porch. 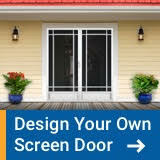 We appreciate handy tips like this! Lori decorated her front porch for fall. Her fall decorating ideas focus upon keeping things simple and finding ways to reuse what she already has on hand. But then, of course, she adds a bit of new touches every year to keep it interesting and fresh. 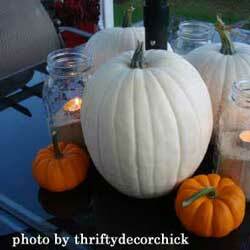 Lori decorates with craft pumpkins and gourds (aka "faux") that you can find at Hobby Lobby or even at dollar stores. Faux pumpkins are catching on more and more. Lori still buys at least one fresh pumpkin for carving and enjoying the seeds. Side note: Dave and I like to buy fresh pumpkins for our grandchildren to roll down our back hill. But the prices we paid this year make it tempting to have our own pumpkin patch - or use Lori's idea of faux pumpkins. 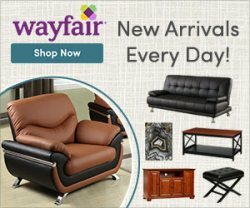 It's very clean and distinctive looking and easily incorporates into all kinds of autumn decorating ideas. The autumn orange of the pumpkins and mums just 'pops' against the black. I wonder if Lori made the striped orange pillow on her rocking chair. It's perfect! I also noticed the decorative black and white ribbon she tied around the pumpkin. 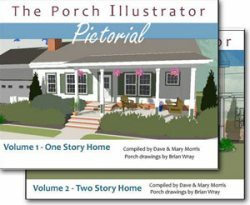 It's those small details that not only make porch decorating fun but also more inviting. Lori's good friend gave her the small chalkboard sign that you see in the fern. She found that old wooden box at a garage sale. Very nice how she weaved it into her autumn decorating. We wonder how she'll use it for the winter holiday time. Can't wait to see. Did you notice the sweet lantern? She filled it with berries and gourds. And the mums? She found those for a fantastic clearance price of just $1.70 at Walmart. She planted them in her urns and hopes they will continue to perk up. I bet they will. Lori made this autumn wreath, too. Simple but so attractive. She purchased a straw wreath as well as some leaf picks, mini pumpkins and even acorns. She used hot glue to put it all together. And the end result is so nice! 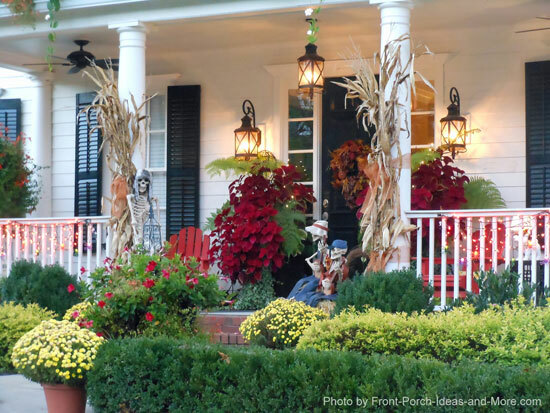 Lori keeps her porch decorated for autumn until Thanksgiving is over. Yeah! 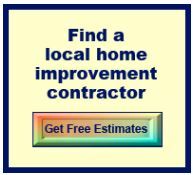 We like that - no need to rush the season. 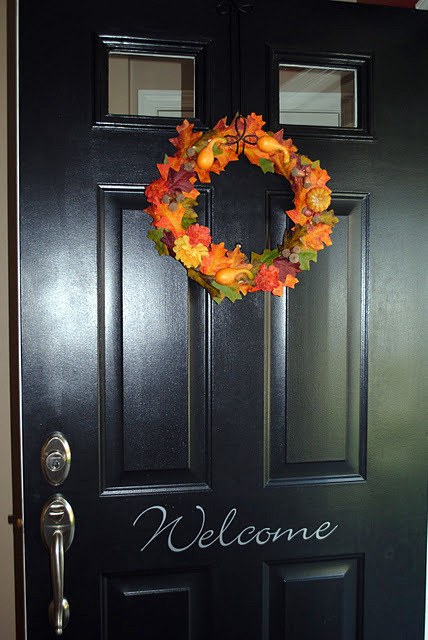 Be sure to see our Thanksgiving decoration ideas too! Lori's outdoor Halloween decorations are subtle and fun. 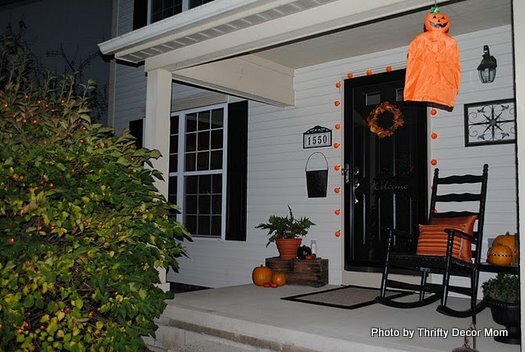 To transition from autumn to Halloween, Lori basically took her autumn porch and added a few fun Halloween accessories. 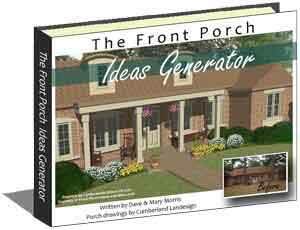 My favorite part is the pumpkin light garland around her front door. A charming touch for Halloween. Lori enjoys shopping at Family Dollar. That is where she found the swinging pumpkins and the tall candles. I wonder if Lori spray painted that one small pumpkin black. Do you think it is a real pumpkin? 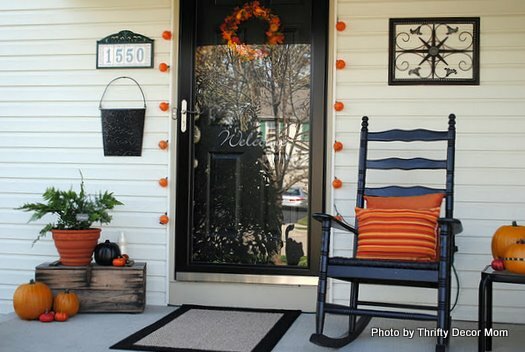 We appreciate Lori's fall decorating ideas and how she transitioned her porch for Halloween. 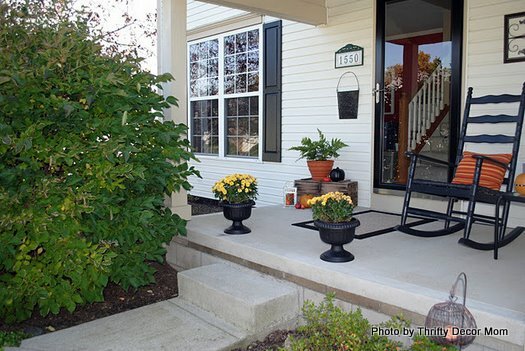 A very inviting Ohio front porch. 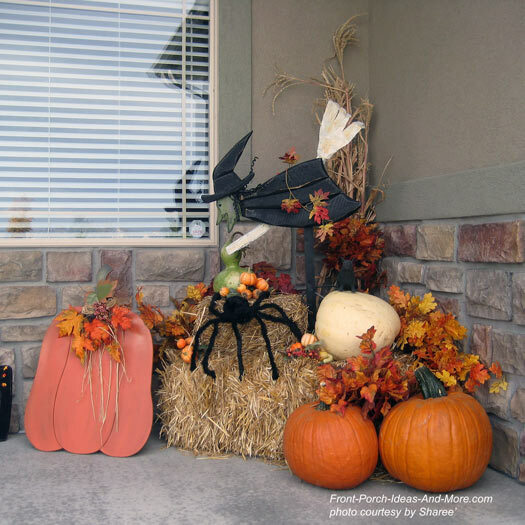 Here are a few more examples of turning common fall front porch decorating displays into Halloween scenes. Simply add fun, whimsical, or even scary Halloween art pieces like the skeletons, witches and spiders you see below to your autumn scene. It is quick and fun to do! 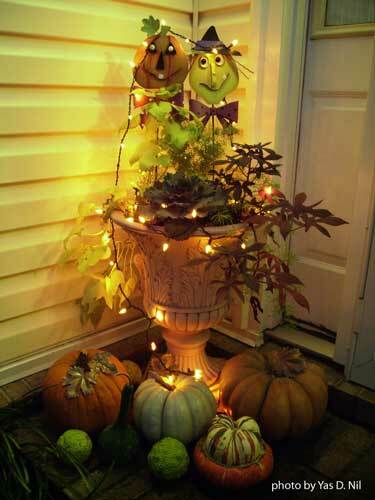 Another option is adding Halloween lighting to your existing autumn display as pictured below. The addition of the whimsical characters adds a nice fun touch to the scene. 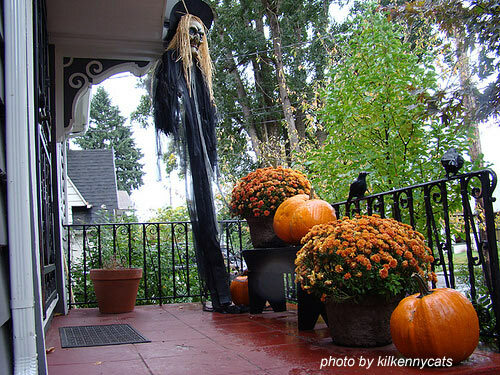 Opting for a bit more "scary" transitional fall decorating ideas? How about adding something like the witch below. That's sure to haunt the little ones! 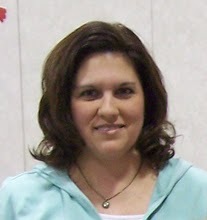 Lori is the Mom of 2 daughters and wife to Eric. 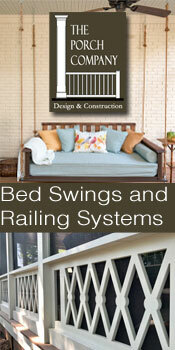 She loves decorating her home in a comfortable but budget-friendly way. She says she has had the decorating "bug" since she was a kid who was constantly rearranging the living room furniture. Lori is the author of Thrifty Decor Mom. 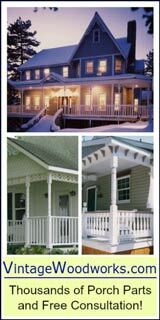 On her helpful blog, Lori shares how she repurposes and decorates on a small budget - and in a beautiful way! 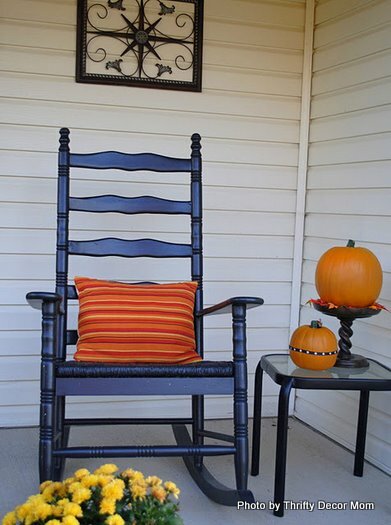 We are most appreciative that Lori shared her fall decorating ideas with us. We like what you have done, Lori. 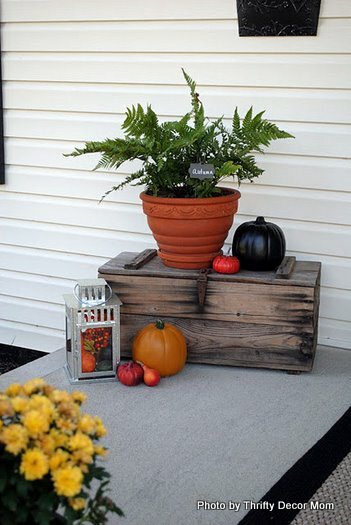 We'd love to see your fall porch decorating ideas and may share them with our site visitors. 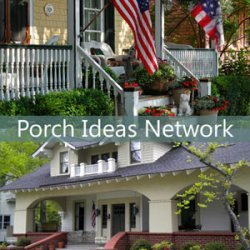 Send your original photos of autumn decorating ideas and/or your outdoor Halloween decorating ideas to us at: info[at] front-porch-ideas-and-more.com Replace [at] with @. 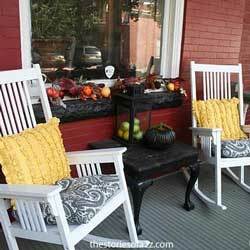 Get more ideas for decorating your porch with pumpkins this year…..